Manufacturer and Supplier of Galvanized Wall Fencing. Our product range also comprises of Aluminium Ladders, Polycarbonate Canopy and Fall Ceilings. 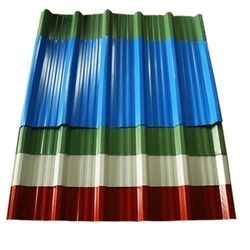 Owing to a long-term destination for our business, we are engaged in offering a wide gamut of Color Coated Galvanized Sheet. Available in various designs and sizes for our valuable clients, provided sheet is used to provide aesthetic look to the buildings. The offered sheet is designed by our adept professionals using the best quality galvanized and sophisticated technology, in adherence with set quality standards. Our company is introducing Galvanized Wall Fencing. Our offered range is made in compliance with industrial standards using sophisticated techniques. Its fire resistance nature and excellent durability. Widely used in homes, offices and commercial places, we are offering Galvanized Wall Fencing to our valuable clients in different design and colors.